DVD (Digital Video Disc) was invented by Philips and Sony in 1995. In a short span of time, DVD became a widely used format as it was capable of storing any kind of digital data. DVDs were widely used to circulate movies, music albums, games, software and more. People were using DVDs for every single purpose like to record their favorite memories so that they can cherish it later, store their favorite content like movies, songs, documentaries to view anytime they want to. And between the years 2004-2007, millions of DVD players were sold generating billions of dollars in revenue. But, with the rise of online media streaming services and better internet speed, the use of DVDs has been declining and coming towards an end. People have shifted towards the digital distribution of media instead of physically distributing discs. In today’s digital era, we can have our content on web, cloud or any device, we don’t need to store them in DVD for any reason. Also, mobile streaming has increased over the years and people love watching it. Now, the question arises, even if we live in this new digital era, how do we get our old memories back which we stored on some DVD a few years ago? The main problem of DVD’s is that it is not resistant to different conditions and due to which they get spoiled or corrupted. Well, WinX DVD Ripper Platinum is the ultimate solution to this problem – a fast, clean and safe DVD ripper program to convert DVD disc to MP4 with H.264 or MPEG4 codec, or other digital videos. WinX DVD Ripper Platinum is capable of ripping any DVDs/ISO images to the hard drives. You can convert DVD to MP4, H.264, AVI, HEVC, MPEG, MOV, and M2TS. Also, it converts DVDs for playback on Apple (iPhone, iPad, Apple TV, iTunes), Android (Samsung, Huawei, Nexus, Kindle), Microsoft (Xbox, Windows Phone, Surface), Sony, and enables you to copy DVD library to Plex Media Server, NAS drive, etc. While maintaining the backup of any DVD the main issue we face is the quality degradation but with Winx DVD Ripper it maintains the original quality without having any effect on the original one. 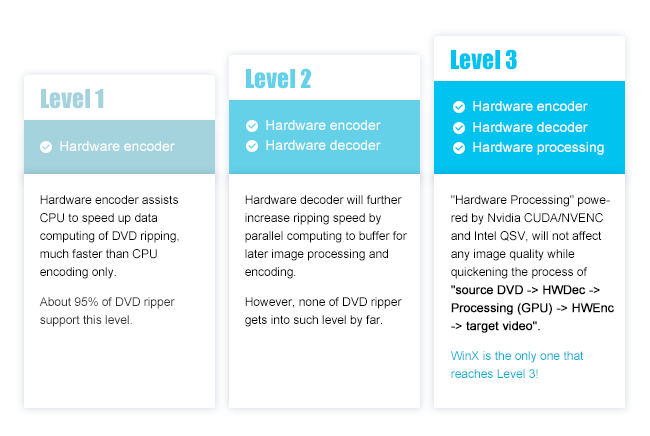 WinX DVD Ripper provides you the fastest speed while conversion and it speeds up by utilizing Intel CPU, Nvidia GPU, Multicore CPU, and Hyperthreading. It can rip a feature-length DVD movie to MP4 (H.624) in 5 mins with 300-500 fps. It constantly updates to support the latest DVDs: homemade DVDs, commercial DVDs, scratched DVDs, workout DVDs, 99-title DVD, folders, ISO images, etc. Step 1: Click “DVD Disc” button to load DVD after inserting the source DVD. You can add DVD folder or ISO Image. Step 2: Select your targeted video format/device. You can also choose “DVD Backup Profile” to copy DVD. Step 3: Hit the “RUN” button and go! WinX DVD Ripper Platinum converts any DVD to any output format easily and quickly. 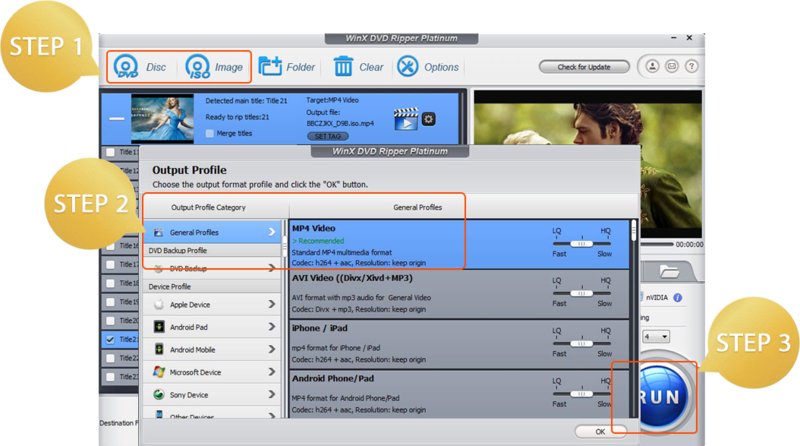 It can convert the DVD to formats such as MP4, AVI (DivX/Xvid), H.264, HEVC, MPEG, WMV, AVC, TS/MTS/M2TS videos and other PC general videos, DVD to MOV and M4V accepted by Mac, and DVD to FLV and more for sharing on YouTube, Facebook, Vimeo and other websites with 350+ profiles! It rips the DVD faster, and that’s what we want. Also, the multiple output options make it one of the best platforms to rip as it satisfies the user requirement. It’s easy and simple to use, even a beginner can rip a DVD easily. Also, you get a preloaded video editor so while processing you can polish your DVD movies, use any of the edit tools available and make the due advantage of it. WinX DVD Ripper satisfies the user requirement and also with some cool additional features allows the user to have a great experience with the platform and process DVD like a pro. The main advantage of using it is that even a beginner can rip a DVD perfectly using its easy to access UI.